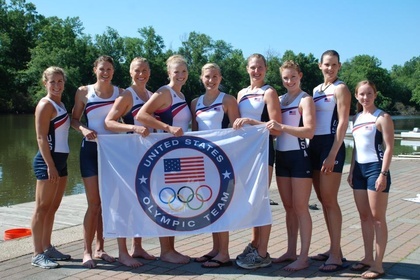 One day after Malcolm Howard ’05 (CAN) became the most decorated male rower in Harvard Olympic history with a silver medal in the men’s eight, Esther Lofgren ’09 and Caryn Davies ’05 joined him on the podium, winning gold with the women’s eight for Team USA. The convincing wire-to-wire victory capped off an undefeated four years since the USA boat, of which Davies was a member, won gold in Beijing. Expecting a challenge from Canada, among other boats, the US boat did what they’ve done on so many occasions before—smoked the competition. For Lofgren, gold marks a dream fulfilled. After her mother barely missed out on the 1984 Olympics and she was one of the last cuts for that gold medal winning boat in Beijing, Lofgren spent the last four years with this moment on her mind. Gold for Davies makes her the most decorated Harvard Olympian in any sport. With back-to-back gold medals to go with silver in Athens, Davies is also the most successful female rower in Olympic history. Earlier in the morning Henrik Rummel ’09 and the USA four continued their hot streak, winning their semifinal and advancing to the A final on Saturday. After starting out slowly they climbed back, proving too much for their opponents and winning by nearly a boat length. Rummel’s boat had never raced together before these Olympic Games, but Rummel maintained throughout training that they were a fast boat which was sure to surprise their opponents. After winning their first heat by a sizable margin, Rummel remarked that it was “surprisingly easy,” but was cautious not to count his eggs before they’ve hatched. With another convincing victory the semifinal, they won’t be surprising anyone as they take on medal favorites Great Britain and Australia. Will Newell ’11 closed off his Olympics with a second place finish in the men’s lightweight four. Understandably disappointed by his boat’s placement in the B Final, Newell vowed to focus on rowing the best race they could. Now that his rowing Olympics are over, he—and the other athletes whose competitions have finished—can truly enjoy the Olympic atmosphere. Tomorrow morning, make sure to watch Brodie Buckland ’06 row for gold for Australia in the A final of the men’s pair. Then, in the afternoon, Temi Fagbenle ’15 and Great Britain take on France in a women’s basketball group stage matchup.